The incision is centered in the middle of the skin which is usually covered by a bra. As a result of removing the excess skin and fat in this area, the contour of the skin in the upper part of the back is improved. There is also an improvement and re-contouring of the skin on the lower back as a result of the lift produced. The incision and final scar can also be extended to link in with a scar from breast reduction or breast lift surgery. This surgery can also be combined with other forms of breast surgery as well as an arm reduction (brachioplasty) as well as other types of body contour surgery,. This surgery can also be used to improve the excess skin that extends around the sides of the body and up into the armpit area. Dr Belt’s fee, an assistant’s fee, theatre fee, day bed or possibly overnight accommodation, specialist anaesthetic fee and the cost of a support bra. These fees attract rebates from Medicare and Private Health funds. Please contact Dr Belt’s rooms for specific amounts. The procedure can be broken down into those of general risks for any procedure and those specific to the procedure. Specific risks include asymmetry with respect to the scar on the left and right sides of the chest, loss of fat & skin (necrosis), wound breakdown, collections of fluid underneath the skin including serum (seroma), blood (haematoma), pus (abscess). Areas of numbness may be present above and below the scar. Smoking significantly increases the risk of complications as does obesity. It is important that patient’s health is maximized prior to the surgery. This would normally require ceasing smoking at least three months prior to the surgery as well as maximising a patient’s weight such that the Body Mass Index is 25 or less. General risks include bruising, swelling, bleeding, wound infections, anaesthetic related problems and problems relating to abnormal scarring (hypertrophic keloid and stretched scars). The surgery is performed as an inpatient and a patient can be expected to stay 1 - 2 nights in hospital. Drains are not normally inserted into the wound. You would be expected to wear a support bra day and night for six weeks after the surgery. You would be seen regularly during your post-operative stay and usually at one week, six weeks, three months, six months and twelve months. 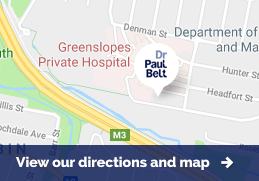 Dr Belt will only perform the surgery under the control of a general anaesthetic administered by a specialist anaesthetist.